At Buffalo Creek Golf Club, near Dallas, understated is not valued. No, everything is big in Texas, including this hidden gem of a golf course. The 481-yard 18th is the longest par 4 at Buffalo Creek Golf Club and the number 2 handicap hole. ROCKWALL, Texas - Dallas, Big-D, D-Town. The unofficial city motto here is, "Live large, think big." This is hardly a city - or a state, for that matter - that values the understated, the sublime, or the subtle. A lack of blatant self-promotion must mean a lack of quality, right? Just outside Dallas, the tony enclaves of Heath and Rockwall boast rolling, wooded topography and an expansive manmade lake - the perfect setting for sprawling estates and bucolic horse pastures. It's perfect, as well, for golf. 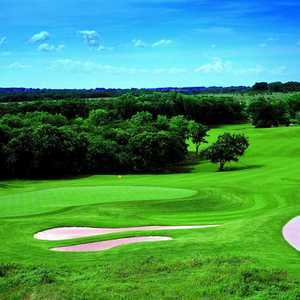 Here in Rockwall, where gems are prominently displayed far more often than not, you'll find Buffalo Creek Golf Club, a solid candidate for "hidden gem" of Dallas golf. Buffalo Creek is a 7,078-yard Jay Morrish/Tom Weiskopf design with a natural feel, despite the presence of impressive homes adjacent to several of the holes. Unlike at several other area golf courses, however, here the homes do not intrude much on the fairways or greens. The homes may sit cheek-by-jowl to each other, but aside from a few closed-in tee boxes and one or two inconvenient OBs, the residential development stays out of your way. One of the first things players here will notice is the magnificent greens. 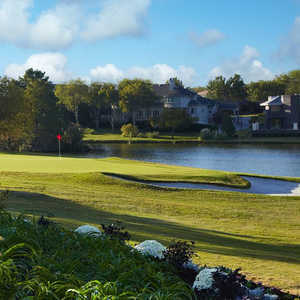 Not only are the green complexes interesting and visually appealing, but the putting surfaces themselves are, according to some locals, the best in the entire Dallas area. I played on Thanksgiving Day, when the rest of the Bermuda grass on the course had gone dormant. Yet the greens were plush and smooth, fast and true, and an almost eerie greenish maroon color. Jason Woodliff, Buffalo Creek's general manager, explained why: "The greens are Champion Bermuda. We do not overseed them in the winter, so they are basically dormant until late February. Most courses in the area choose to overseed their Bermuda greens with rye grass because they look better in the winter, but we found that when we tried this they were patchy and did not putt well. They are brown right now and will actually turn slightly purple as it gets colder in January. But they putt great, which is ultimately what matters and what the golfer wants." Indeed, one of my playing partners exclaimed that the dormant late-November greens at Buffalo Creek were the best he'd putted on all season anywhere in the country. Another hallmark of Buffalo Creek is the superb mix of holes. Par 3s measure at the tips from 156 yards up to 227 yards, and par 4s from 347 up to the staunch, round-busting 481-yard 18th. And while one of the three par 5s is reachable in two at 523 yards, the others (572 and 611) are not. 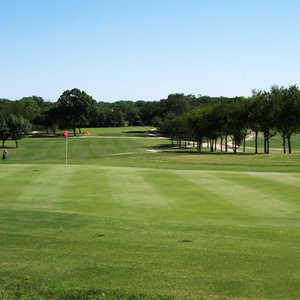 The two stand-out holes are the 478-yard, par-4 sixth and the 611-yard 16th, which have been ranked among the toughest in the Dallas area. Both feature water down the left sides of fairways that gradually narrow and end at cross-hazards. At this point, long second (or third) shots test even the best long-iron for fairway wood players. At the sixth, a long approach is required over water to a green tucked behind yet another pond and two gaping sand bunkers. At the 16th tee, you see water left, woods right. From the non-too-generous landing area, you fire across a deep ditch through a narrow throat of pin oaks and hickories uphill to the green (which is, thankfully, fairly receptive). "Whoa," gasped one of my playing partners on the 16th tee. "This is an adult par 5." As for the sixth, he described it as "a big-boy par 4." Buffalo Creek may be rather un-Texas-like in its lack of self-promotion, but it delivers holes, shots and challenges plenty big enough to be listed among the top public courses in the Lone Star State. The staff is friendly, the clubhouse grand and the practice facilities are excellent. This is all the more pleasant when one considers the green fees, which are also surprisingly small for the state where everything is big: $26-$65. The only gripes here are minuscule in comparison to the praise. First, the spacing of the tees is a bit awkward for average golfers. The championship tees are obviously too long (7,078 yards), and the back tees may be as well for many average golfers (6,499 yards). But the middle tees (5,863 yards) are way too short. Something in the neighborhood of 6,250 would be perfect to help keep the speed of play moving along a bit more crisply. Speaking of pace of play, another kvetch, which is not limited to Buffalo Creek, is the acceptability of fivesomes. Apparently throughout Texas, fivesomes are readily accommodated, making for some excruciatingly long rounds on busy days (and even not-so-busy days). But, hey, this is Texas, where more is mightier, bigger is better and louder is prouder - unless you're talking about Buffalo Creek, the unheralded star of Dallas daily-fee golf. For more information on Buffalo Creek Golf Club, call (972) 771-4003 or visit buffalocreek.americangolf.com.